Here’s something we could all do over the weekend: build an intricate web of ever-changing statistics modelled on real-world systems, and then transpose them back into something that, to a casual observer, looks an awful lot like real-world people at work. Don’t feel up to it? Thought not. Thankfully, Sports Interactive have the time and the wherewithal to build something just like that: the 3D match engine for Football Manager 2014. Here it is in action. I remember my mouth dropping a bit, watching my uncle watch Championship Manager’s real-time commentary-only screen in the ‘90s, as I realised that this was the game. But for many it’s still the only way to tackle the simulated business of kickabouts. There’s the odd moment where a football-bot turns in angular fashion and reveals himself as a replicant, but it’s otherwise dead good. Those dynamic cheers, eh? 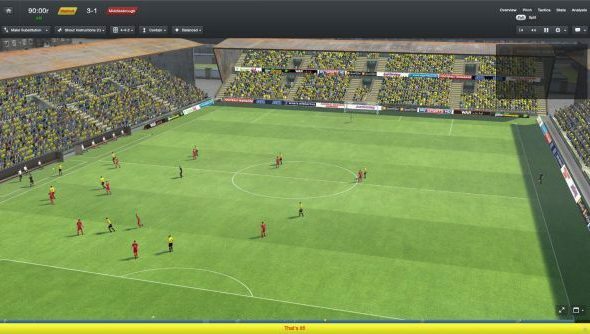 A Football Manager 2014 release date has been set for October 31. Soon.